In their continued effort to grow the quality of medical care in Pahrump, Desert View Hospital announced the addition of a new surgeon to its team. 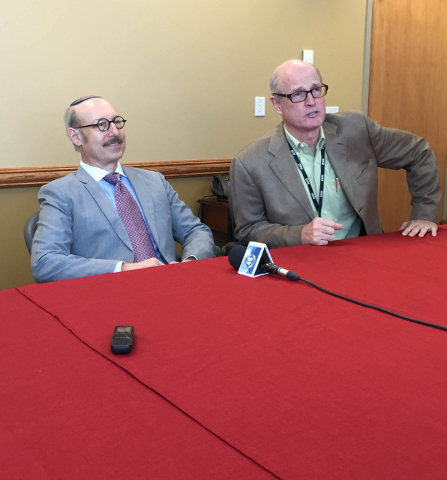 Dr. Rick Bernstein, who is board certified in vascular, endovascular, and thoracic surgery was introduced to the area at a press conference at the hospital Wednesday. Bernstein won’t be at the hospital every day, he’ll make a trip out here from Las Vegas once a week, with Thursday being his usual day of the week as it stands now. Bernstein, a graduate of the Howard University College of Medicine, has over 25 years of experience in the field of vascular and thoracic surgery, starting out in the Midwest, then moving out West, to Las Vegas in 2003. As the medical director for The Advanced Vein Treatment Center in Las Vegas, Dr. Bernstein is one of only five vein specialists in Nevada who is Board Certified by the American Board of Phlebology. Being versed in multiple areas of expertise allows Bernstein to address a wide variety of medical needs. Being as minimally invasive as possible is Bernstein’s goal, as he credits advancements on technology for that ability. Being able to catch vascular issues before they reach a critical stage is key to allowing an affected person to be able to heal and move on with a normal life. “We can treat them before they get into trouble, and the main trouble that people get into is what we call critical lymphocemia, where they get pain when they’re doing nothing,” Bernstein said. “When people get to that, then their risk of being around in five years drops considerably. Bernstein is comfortable working in a rural community as he has done work in similar areas in the Midwest. With that knowledge he already has a plan in place to treating his patients in Pahrump. “Address which ones (patients) can be done here and which ones still need to go to Vegas,” he said. “But I can follow them here so they don’t have to go back and forth to either do their wound care, or for me to follow them post-operatively, even if they need to be seen in Las Vegas for a little while I can do their follow-up here. So it makes for less travel for them. If you have any questions for Dr. Bernstein or want to set up an appointment, contact him at 702-561-0210.